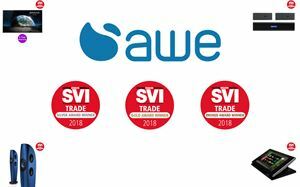 AWE is delighted to have been awarded multiple accolades in the SVI Trade Awards 2018, including an award in the Best Distributor category. Voted for by industry professionals, this award recognises the combination of customer service, competitive pricing, access to leading brands and training, and demonstration facilities. Elsewhere, AWE-distributed products were successful in a host of categories. The AWE Exclusive HEOS SuperLink won Gold in the Best Digital Audio Streamer category, with the wider HEOS by Denon range winning Gold for Best Mutli-Room Audio Solution. SANUS RACKS UP GOLD AWARDS! Awarded Gold in the Best AV Furniture Solution and Best AV Mounting System for its Component Series Racks and Black Series respectively, SANUS cements itself as a key manufacturer for AV storage units, racks, and accessories. DOUBLE GOLD FOR URC TOTAL CONTROL! Control expert, URC won a Silver award for the MRX-10 processor in the Best Wired Control Device category, and the Total Control 2.0 app awarded Gold for Best Specialist App. The URC TDC-7100 is also Gold-award winning in the Best Wireless Control Device category. Kinetik also made a mark as the newly introduced Ultra Slim CAT-6 Cable was voted Gold in the world of cable & connections, while the Marantz SR5012 triumphed with Silver for Best AV Amplifier, and the stunning KEF Blade 2 won the Gold for Best Floorstanding Speaker. Draper ReAct won Silver in the Best Projector Screen category and the HDanywhere™ MHUB 8x8 Pro was awarded GOLD as the best video matrix. To find out more details on the products distributed via AWE visit www.awe-europe.com call +44(0)1372 729 995 or email [email protected].